PACE – A New Tool for Big Water Savings in the ICI Sector highlighted how the Property Assessed Clean Energy (PACE) financing program can be utilized by commercial, industrial, and institutional water users to incorporate water conservation upgrades (as well as energy efficiency and renewable energy) in their buildings. 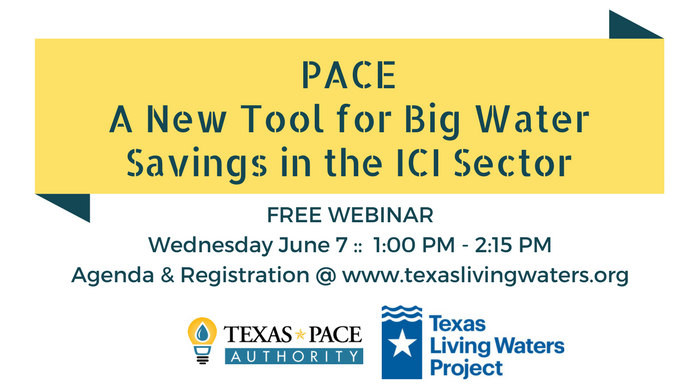 The webinar featured leadership from the Texas PACE Authority and ICI industry water conservation professionals. They described how the PACE program works and what the benefits are as well as strategies and water savings that are possible both inside and outside your facility. How much water is being used in the ICI Sector and what can be saved?